Photographer: Julia Noni. Model(s): Ajak Deng. Source: Vogue Germany. Stylist: Nicola Knels. Makeup: Frankie Boyd. Hair: Panos Papandrianos. Ajak Deng evolves as she takes on the über-dynamic role of Grace Jones in ‘Athletic Grace’ by Julia Noni for Vogue Germany, March 2019. Sinewy shapes & unbearably, longs limbs lend themselves to this body of pure grace. 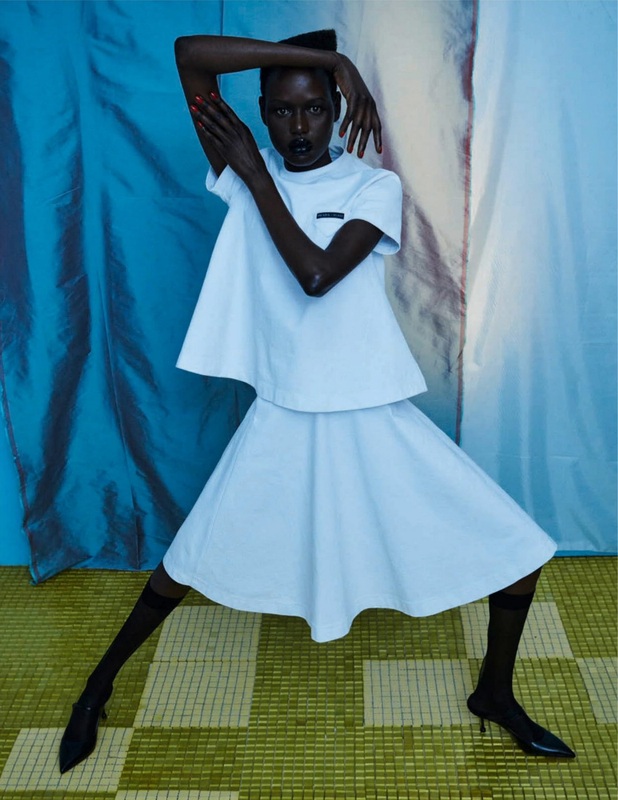 Ajak Deng gives us the flavor of Grace Jones without mimicking her. An ode of the highest order. Each image is exquisitely captured and artfully portrayed. 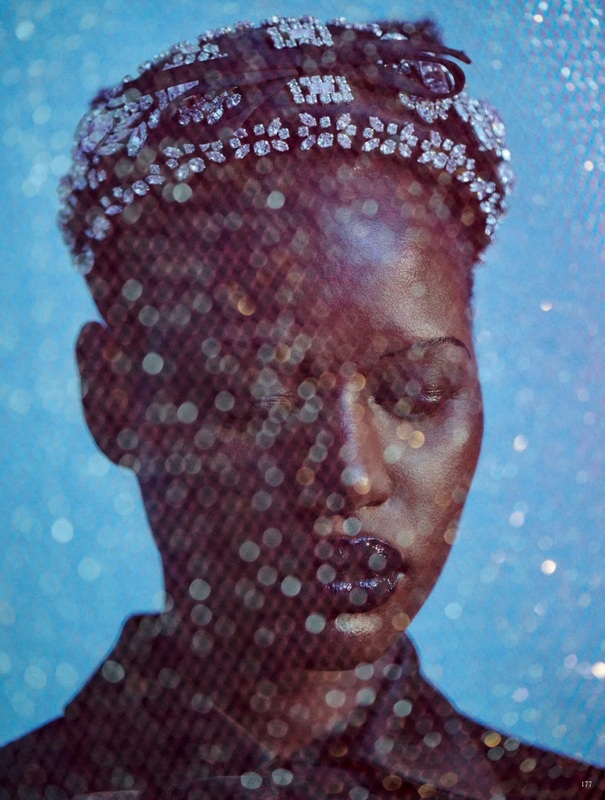 A thrilling mix of art and excess, Ajak delivers one of the most exquisite editorials of the season. Jones was well known for her outrageous appeal. She bent the boundaries of gender, while exploring the art of androgyny. Always a creature of creativity first. She believed first, last and always in the act of self expression. Far ahead of her time, she was embolden. Holding strong to the fundamental purity of artistic vision. Nicola Knels is absolutely fabulous at surrounding this story with fashion that elevates as it celebrates. At first glance you might think there is no cohesion in this collection. However, as the accessories and fabrics come into view, we start to see the fusion unfold. Designs take us back in time, from grommets topping her leather gloves to a diamond encrusted head-band. 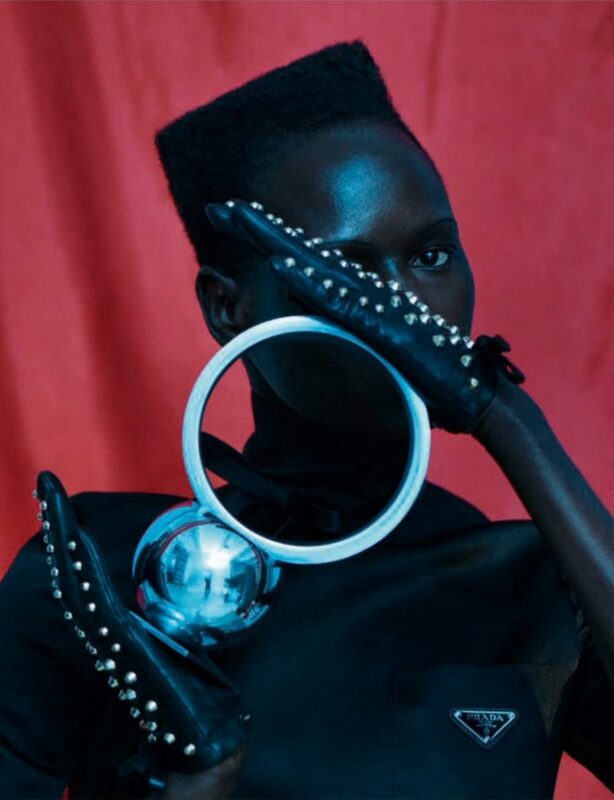 One of the most dynamic pictures has Ajak laying sideways against black plastic, with circular shapes sewn on a mini-dress. The highlight of this story seems to be the infamous black, Prada nylon sock. 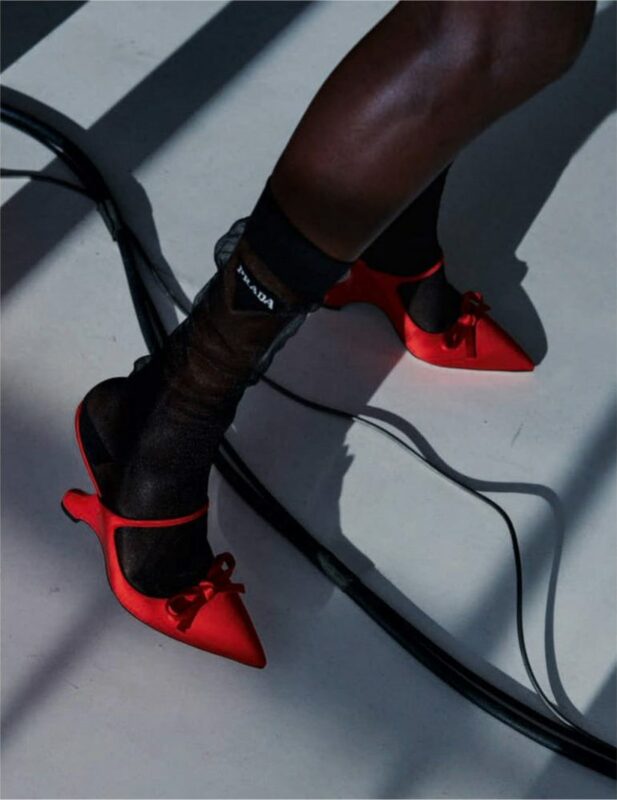 Drooping down in sheer decadence, as it shows off red the jewel-toned, kitchy-kitten heels. This story elevates the accessories. Allowing them to shine. for a deeper sense of spirit and dare I say… Grace. Frankie Boyd lines the top of her eyes with a dark shade to provide balance. But, it’s the brows that take center stage. Back in the day Jones’ brow-lines were often seen in the extreme. Frankie honored the original intent by keeping the lines ultra thin. Lined in black, these thin brows pay homage to the past while speaking to the future. Using a deep stain, tinged with a hint of cherry, gives her gloss the dimension it needs. These aren’t just lips they are works of art. The shape is stunning in fullness and form. While her wide set eyes are both innocent and wild. A combination rarely seen. I am captivated by the curves of her face. Viewed as a intergalactic warrior queen, Grace’s face was where the magic of makeup would take place. Here we see softness and strength combine in a similar way. Staring through the screen her eyes strike us with kindness while they brim with intensity. Frankie keeps the application process simple, which allows him to focus in on the features he wants to highlight. This merger integrates various intensities. A synthesis that provides dynamic results. 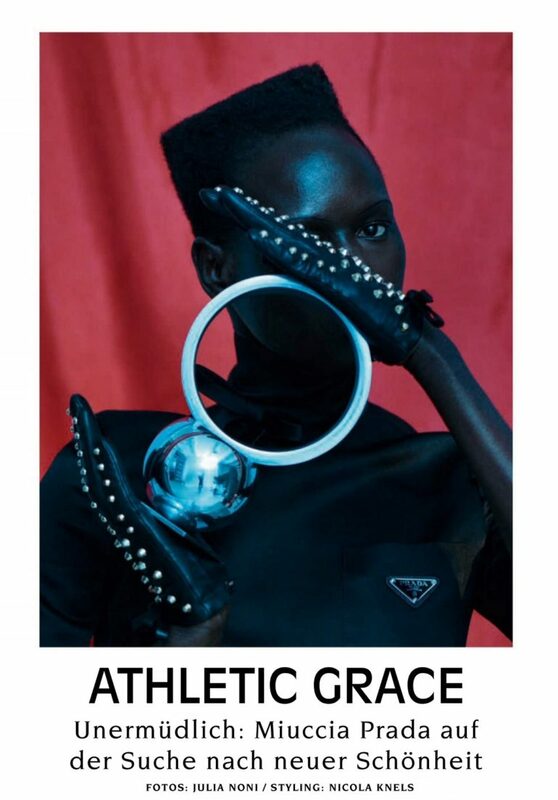 Panos Papandrianos honors the divine beauty of Being Grace by giving Ajak a similar, tapered fade. Thereby paying homage to the antics of the avant-garde. He captured the mood of the era with strong hair shapes and defining angles. I take pause when people describe Jones’ look as aggressive. It isn’t aggressive it’s edgy. The look was literally a force of nature. But, what we see with Ajak is that strong can mean so many things. The sweetness of her eyes are met with the beautiful contours of her face, giving her a softer appearance than Grace Jones – but no less intense. Art is in the expression. The empowered strength you share and the intensity by which you share it. Not defined by the times, this look is saved for the chicest among us. A perplexing paradox, Grace was always a walking, talking Enigma ~ that lived beyond stigma. She was an Intergalactic Warrior Queen. A force to be reckoned with she is/was exquisite. It was there in the era of the undecided that this female fighter stepped into show us what it meant to embody your spirit. What makes this story so unique, isn’t that they bear some resemblance, it goes deeper than that. They both have an inner fire that fuels the female story. Subtly similar yet refreshingly unique, these women call to each other as they call to us all. We are all sisters in this, War On Women. And, like sister’s in arms, we’re all a unique version of the same sweet child. 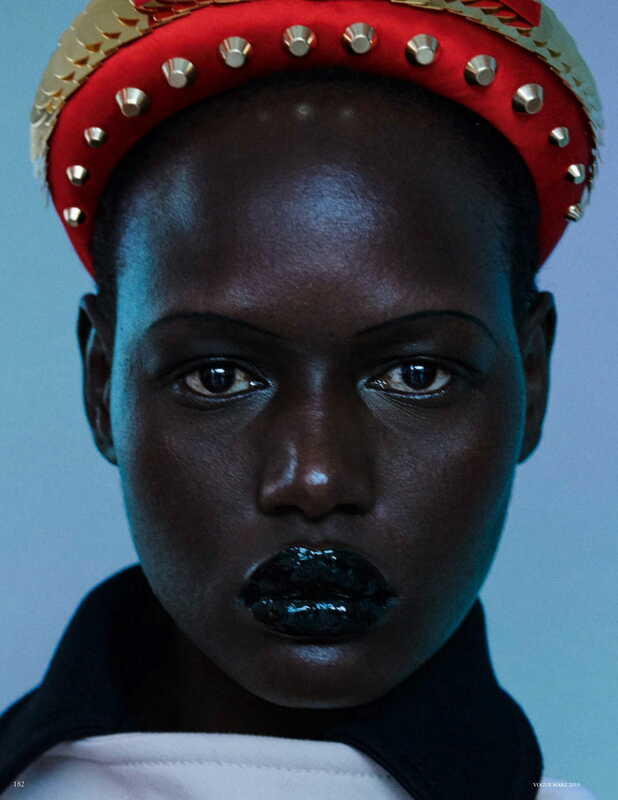 Ajak Deng Lets Dark Night Fall All Around "Uncertainty"
Ajak is Celebrating 15 Years "This Time We Won't Ask"